Summer is upon us and our feline frinds are dying to go outside because they like to hunt, play or just sunbath. There are more cons to let your cat roam outside. They vary from you cat getting lost, run over by cars, to being attacked by other animals. Cat owners uncertain about keeping a pet indoors can give their cat the best of both worlds by offering outdoor experiences in controlled situations. Perhaps the best solution of all is a cat enclosure where cats can enjoy the outdoors in a safe environment. The kittywalk cat enclosures offers protection and keeps the cat from wandering away. 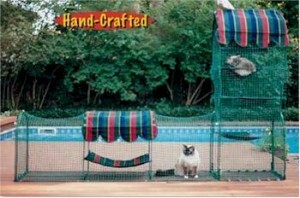 Their outdoor enclosures are an ideal cat enclosure offering enough space to move, climbing options, and a resting area. They have shady areas so the cat can enjoy fresh area even on the warmest days. Concerns about formerly outdoor cats adapting to indoor life are valid but a cat enclosure often solves the problem of letting your cat enjoy the great outdoor.